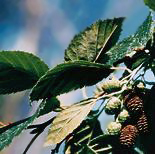 A coarse shrub or small deciduous tree, 2 to 10 metres tall; often occurs in clumps. Leaves are thin, oval-shaped, and rounded to somewhat heart-shaped towards the base. The tips are rounded to blunt shaped and the margins are shallowly lobed and double toothed. The upper surfaces are green, the lower surfaces hairy and pale. Male flowers are long, drooping catkins, 3 to 4 centimetres in length. Female flowers are in short, woody, brown cones. They are produced on the previous season's twigs before the leaves appear. Seed cones have very short stalks. The seeds are nutlets with a very narrow wing. Yellowish-brown with distinct oval-shaped ruptures or tears on the bark (lenticels). It is common throughout British Columbia east of the Coast and Cascade mountains, at mid to subalpine elevations. 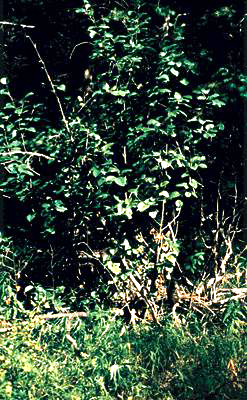 Mountain alder occurs in moist, nutrient-rich forests along streamsides and bogs. It often occurs as dense clumps with willows, twinberry, red elderberry, and horsetails. Deer and hares sometimes eat parts of the stem. Because of its hardness, some Interior aboriginal people used mountain alder wood for making bows and snowshoes. Because it doesn't flavour the food, they also used it for smoking and drying salmon and meat. Like red alder, it was a source of dye and a substance for tanning hides. The Carrier made fish nets out of mountain alder and dyed them black by boiling them in their own juice. Fish cannot see the black nets.